The demand in the global market for biofertilizers is anticipated to surge at a hearty CAGR of 12.9% within the forecast period from 2017 to 2025, picking up footing from various factors, for example, growing awareness with respect to its wellbeing and environmental advantages, steady move from chemical farming strategies to natural organic ones, developing popularity of biofertilizers in soil fertility administration activities, development of the organic food sector, and ascend in the cost of pesticides and chemical fertilizers. 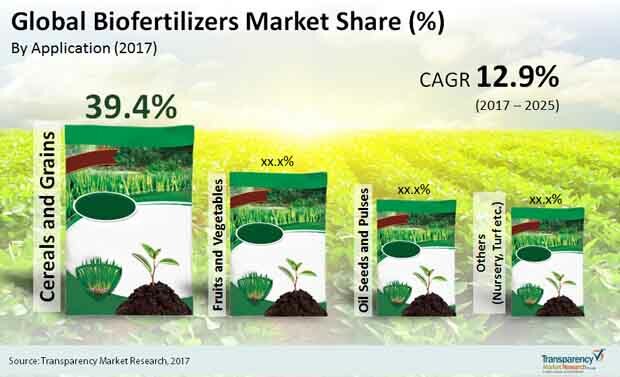 Then again, less awareness in a few potential developing markets, poor framework, and technological limitations are hampering the potential growth of the biofertilizers market. The global biofertilizers market is assessed to be worth US$4,092.1 mn before the end of forecast period, 2025, up from its assessed valuation of US$1,254.2 mn back in 2016. With the rise in awareness with respect to biofertilizers in the growing economies by means of steady government bolster, the players are expected to witness significant development in terms of revenue and growth. On the basis of application, global biofertilizers market has been segmented into fruits and vegetables, oil seeds and pulses, cereals and grains, and other segment such as ornamental plants and nursery turfs. As of now, oats and grains classification gives the highest demand for biofertilizers, attributable to diminishing arable land and substantial rise in population. It has been recognized that oats and grains require impressive measure of biofertilizers for appropriate development. Wheat, rice, oats, corn, and grain are a couple of significant oat and grain crops developed broadly over the globe. Ranchers have begun to utilize biofertilizers as a substitution to chemical manures as it helps in managing the soil supplement production cycle. This improvement has raised the demand for biofertilizers, particularly for oat and grain development. In terms of product, the global bio-manure market is classified into phosphate mobilizing nitrogen fixing biofertilizers, biofertilizers, and potassium based biofertilizers. Among these the cases of nitrogen based biofertilizers are anabaena, nostoc, azotobacter, and clostridium. Cases for the phosphate manufacturing biofertilizer can be microbacterium laevaniformans, psuedomonas putida Bacillus edaphicus pantoea agglomerans, and, which is a standout amongst the most widely recognized potassium activating biofertilizers. On the basis of geography, the global biofertilizers market is segmented into North America, Europe, Africa, Latin America, The Middle East, and Asia Pacific. Regarding utilization, North America at present serves the most surged demand for biofertilizers, trailed by Europe. This rise in demand for biofertilizers from these two regions can be credited to the good administrative situation in these regions that include several nations, for example, The U.S., Canada, Russia, and Germany. The rise in demand for high yielding products are more in these region as well. The need for biofertilizers in North America is additionally an impression of the advancement of biotechnology and in addition progressions in molecular biology. Common Agricultural Policy planned by the European government supports organic farming and the utilization of biofertilizers. In Asia-Pacific district, the market for biofertilizers is anticipated to thrive in the coming years inferable from the overall innovations and growth in population in the mentioned region. Some of the key players operating in the biofertilizers market are Novozymes A/S, Biomax, Protan AG, T. Stanes & Company Limited, Bodisen Biotech, Inc., PotashCorp Agri Life, Symborg S.LGujarat State Fertilizers and Chemicals Ltd., Italpollina SpA , Rizobacters Argentina S.A, and Rashtriya Chemicals and Fertilizers Ltd.